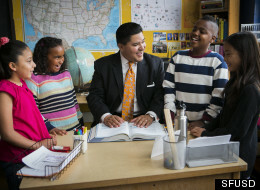 Who: Richard Carranza, Superintendent of the San Francisco Unified School District. Current Gig: After serving as San Francisco's Deputy Superintendent of Instruction, Innovation and Social Justice, Carranza assumed the role as the district's head honcho this past July. Since he began working on behalf of San Francisco schools, Carranza has made closing the city's "achievement gap" -- providing all the district's students with equal access to quality education -- his top priority. And it's working. San Francisco public schools saw a rise in standardized test scores across almost every subject this year, and the city's most underperforming institutions have all shown signs of improvement. Carranza, who grew up in Arizona, entered his own school system speaking no English and spent more than a decade in front of the classroom as a high school teacher before crossing over to the administrative side. He caught up with The Huffington Post just in time for Back to School to discuss his goals for the new year, why money really does matter and where he finds inspiration during his down time. What brought you to San Francisco four years ago? The school district. It was very impressive; the strategic plan was engaging to me...the notion of really focusing on closing the achievement gap. I was drawn by the integrated way the city works, the way of living in SF, the political climate, the environmental climate. Everything about San Francisco was truly appealing to my family. Do your own kids attend San Francisco schools? I have two daughters in the SFUSD. One is a sixth grader and the other is a high school junior. What are some of your biggest goals for the district? The achievement gap is our critical area of focus. Our goal is to increase access and equity for all students. The fact that a large urban school district in the United States has called out the achievement gap is a breath of fresh air. Most school systems will allude to an achievement gap but won't address it directly. It's really a social justice issue. How do you measure the achievement gap? First and foremost we measure what our students are learning. I'm not a proponent of testing for testing's sake, but its one variable we have to look at. We're looking at our data very closely and asking, are students starting to catch up? And are they? The data is starting to show that students of color are starting to make up some ground without sacrificing the improvement of other students. Students of color are starting to accelerate. That's really exciting. Our work is to identify why these students are showing this increased acceleration. What's behind it? How can we replicate it? It's great teachers, a specific and rigorous curriculum tied to state standards. It's having coaching for instructional practices, it's providing intervention for students who are not successful. Can you describe the ethnic makeup of San Francisco's student body? Off the top of my head, I believe it's 33 percent Chinese, 12 percent white, 24 percent Latino, 10 percent African American, nine percent Asian [non-Chinese], 12 percent other/declined to respond. We dont have any one ethnic subgroup in San Francisco that dominates. It's pretty heterogeneous. What's the one biggest challenge facing the student population? Funding is absolutely critical to us. We've never funded schools the way we should have funded schools. And funding really does make a difference. How so? It takes funding to be able to provide better classroom instruction. We're proving that point in San Francisco. Students come to school with lots of needs. They may be homeless, have nutrition issues, have health and dental issues. The schools serve as the hub for those students and their families to access broader services. iI takes funding to have people on staff be able to make those connections. We are proving that we can make a difference when you use funding in a strategic, well-defined way. A common criticism among San Francisco residents is the lottery-based system in which students are placed in schools. How do you respond to those criticisms? The school assignment policy is a work in progress; it's an evolving process that the Board and I will continue to look at. We're dealing with multiple opinions and examining the data, and it will be a continued conversation. What about the families who threaten to move to the suburbs as a result? The ironic part is that SFUSD is the highest achieving large urban school district in California. Do you ever miss being in front of a classroom? I loved being a teacher; I went kicking and screaming into administration because I was tired of complaining. I still miss the classroom. I consider myself a teacher who happens to sit in the administrator's chair. I love what i do as a superintendent; it's an important role only if you keep the focus on the classroom. I like to think thats what my focus and my legacy will be here. Outside of the schools, where do you find inspiration around town? I never get tired of looking at the Golden Gate. I find peace when I see it. The ability of the human race to build these magnificent structures goes beyond me. To think at one time or another all these people were in school! I grew up in Tucson, was the son of a sheet metal worker and a hairdresser. I never thought that one day I'd be responsible for 55,000-plus students in a city like San Francisco, and I'd be able to ponder my job while looking at the Golden Gate. That spot really conjures gratitude for the blessings I've had.